Hey! Looking for Ricochet ATV Skid Plates or ATV A Arm Guards? Get protective armor to protect your machine. It was 1977 in the heart of the Salt Lake valley that Don Gibbs, an accomplished motocross racer, opened the doors to Utah Sport Cycle. Specializing in KTM, Maico, and Husqvarna sales and service Utah Sport Cycle quickly became the place to go for serious and experienced riders to get their bikes race ready. At a time when dirt bike performance technology was enabling riders to traverse terrain never before possible there quickly arose a need for a heavy duty light weight skid plates to protect ones pricey investment. With limited options on the market at the time,Don began fabricating his own simple but very effective designs to offer to customers, and so the Ricochet skid plate was born. For over 30 years Ricochet has been leading the industry for making the strongest ATV skid plate.Ricochet offers the ultimate in protection for your off-road machines. 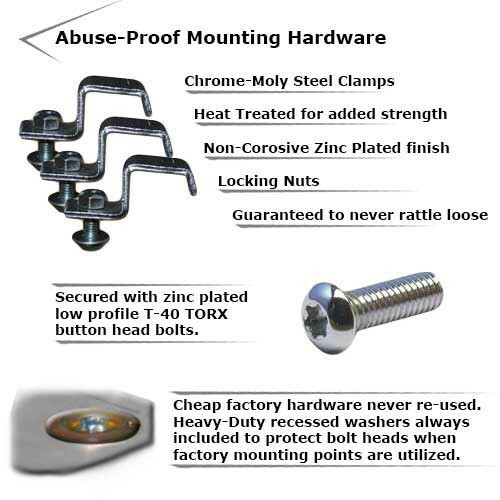 Made with 3/16" 5052 H-32 Aluminum and are designed to protect your investment from what nature dares to bring on. From rocks to ruts Ricochet will protect your ride. Unlike other systems on the market this armor is designed to bolt right on with easy access points for those important areas that need maintenance. TheATVSuperStore.com offers the lowest prices for Ricochet Skid Plate Systems on the net. We offer Custom Anodized Aluminum on all A-Arm Sets. Cant find what you are looking for or if you can find it for less Please contact us! We will make it worth your while! We value & want your business! At TheATVSuperStore.com we test and use what we sell.The Ricochet product is on all our quads & UTV's. Any questions just call. We love to talk off-road wheeler talk! Orange & Black A Arms show above.